The flowers are blooming, but the temperature here in Northern California is still cool. It doesn’t really feel like spring! I can’t wait for the warm days of summer to hit – then it’ll be time to hit the beach and dig into my to-be-read pile. If you’re looking for more books to read, be sure and scroll down to May’s Giveaway. The Reviews are in: Whirlwind is a Hit! Even in this digital age of twitter, facebook, and everything internet, when it comes to books, word of mouth is still king. Whether it’s through email or a phone call (you remember those, right? ), what people say about a book is what counts. Thank you to everyone who’s read and recommended Whirlwind to friends, and a double thank you to those who’ve reviewed the book online. The feedback has been great, and very favorable. In addition to readers, a few book bloggers have also reviewed Whirlwind. Be sure and check them out – you can find a list on my website under the Reviews tab. Did you know you can write your own review of Whirlwind? If you have an Amazon or a Barnes&Noble account, or are on a social book site like Goodreads, LibraryThing, or Shelfari, you can post your own reviews. You can also check out what other people are reading and saying about books. I’d love to hear from you! If you’ve been following my blog, you’ve had a little taste of my experience at the RT Booklovers Convention. (RT is formerly Romantic Times.) It was an intense four days of networking, workshops, and yes, parties. I especially enjoyed meeting all kinds of readers at the Indy Expo, and giving away book bling (my handmade ribbon bookmarks). Many readers were e-book users looking for good electronic titles to download. As a reminder, Whirlwind is available in both the Kindle and Nook bookstores. 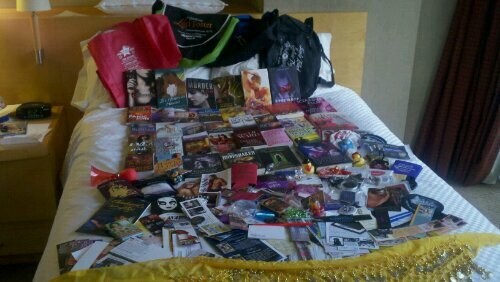 How would you like some of the freebies I got at RT? All you have to do is post a comment on any of my blog posts during the month of MAY to enter. The grand prize winner will get 5 books from the haul, and a runner-up will get 2. And if you don’t have Whirlwind yet, I’ll include an autographed copy as well. So check out https://robindejarnett.com/blog/ and say hi. You could be a winner! Coming Soon – AKA What am I Writing Now? The project at the top of my list is the sequel to Whirlwind, currently named Quicksand. Melissa and Jason’s journey continues, picking up days after the end of Whirlwind. I can’t give away too much yet – the story isn’t quite done – but Melissa has to adapt to a lot of changes, not the least of which is the dislike of Jason’s best friend. I’m also in editing on another story – a short story – that will be coming out this summer. It’s part of an exciting collaborative project that will be announced in a month or two. Be sure and subscribe to my blog to get the latest news and information. Finally, in June, I’m going on tour! A virtual tour through the internet. For two weeks, from June 6th to June 17th, I’ll be visiting or be featured on various blogs throughout the internet. There will be prizes, outtakes, and other special treats along the way. Big, big thanks go to Missie at The Unread Reader for hosting the tour, setting up the stops, and just being an all-around terrific lady! Hope to see you along the tour! NOTE: I label this recipe as the BEST because it’s gone over so well with everyone I know – even hard-to-please 10 year-olds! If fifth graders will eat it, it must be pretty good! In a large non-stick skillet, saute leeks and onion until soft. Add butter and flour, cook for 3 minutes. Add chicken broth and potatoes, simmer 30 minutes. Remove from heat. With a stick blender, carefully puree the soup in the skillet until smooth. (You can also use a blender, but the soup is very hot.) Whisk in the sour cream (you can use less than the whole container, depending on taste), and parsley, if desired. Salt and pepper to taste. Great hot on cold days, or cold on hot days. This is a quarterly newsletter sent by Robin DeJarnett. If you’d like to be removed from this list, simply respond with “Unsubscribe” in the subject line. Feel free to forward this email.